I’ve volunteered my time to help university students work on thesis projects, I’ve managed students and interns professionally (and have written down the best-practices) – but a real thrill came when I was living in India and had several friends and colleagues that worked to support Indian students from lesser-priviledged backgrounds. 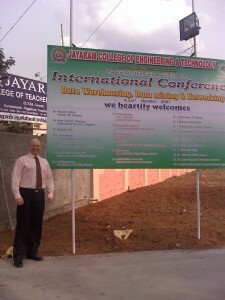 I was stunned but honored to be invited as the keynote speaker to this conference in a very remote village in the southern Indian state of Tamil Nadu. The venue was a college dedicated to IT, in which the students all receive laptop computers (quite remarkable, when you consider the standard of living in India!) – and they can pursue studies based on career tracks such as Java or Microsoft .NET. For as remote and rural as it is, Jayaram College in the countryside of Tamil Nadu had a better IT infrastructure than the main offices of Hewlett-Packard in Germany! What stunned me and what I could never have expected: this tiny college, Jayaram College of Engineering and Technology, in a very remote region of southern India, had a better and more modern IT infrastructure than our main Hewlett-Packard offices in Germany! For you see: the campus installed a real-time videoconferencing system (no easy task in 2007) that allowed them to share courses and lessons between their universities and several others. 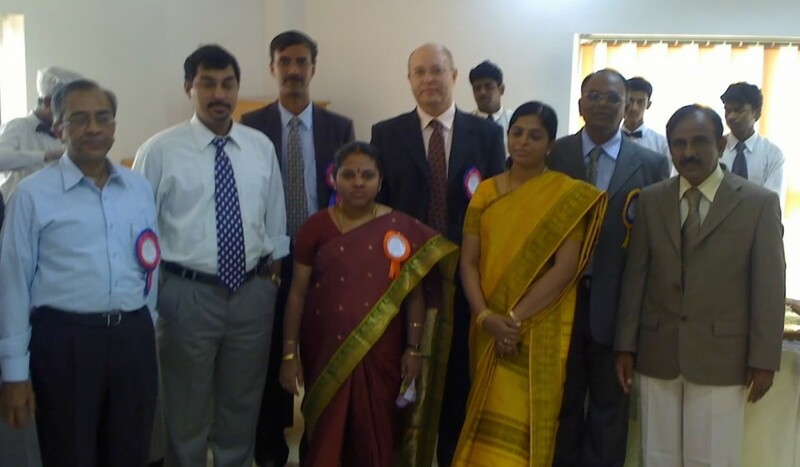 My good friend Ranganathan Sourirajan is standing immediately to the left. What is amazing if you know me: At over 6 feet, I am a tall guy, and I was dwarfed by these even taller Indians! The conference itself was fabulous. In addition to delivering the keynote speech, I also gave a technical talk about Information Lifecycle Management (ILM). But I’ll never forget the great students who were shocked (but positively so!) when I choose to sit with them in the audience, instead of off to the side with professors. Hierarchy and decorum in India dictate that the professors are treated with respect, so they sit in these big comfortable chairs separated from the students. But I was there to meet the students and talk to them – so what better way than to sit next to the students! Icing on the cake – my largest ant hill yet! 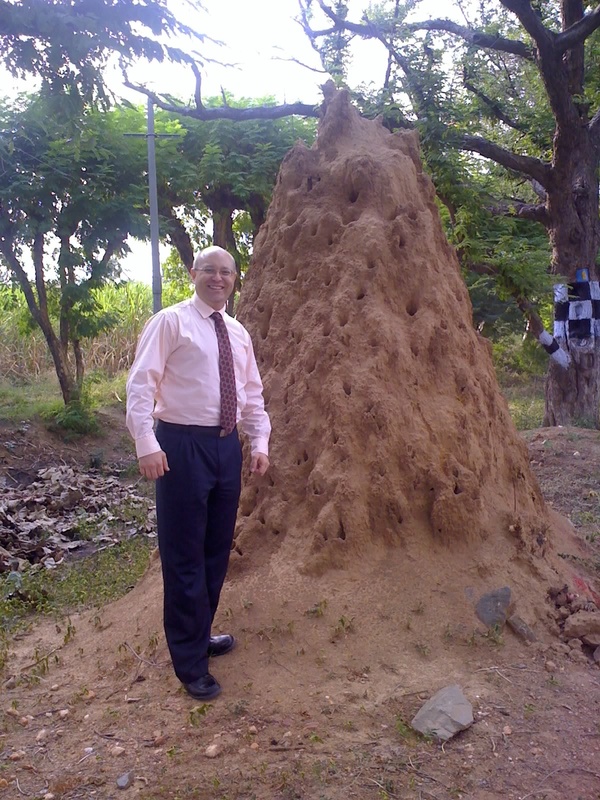 Discovering and observing huge termite nests or anthills has been a hobby of mine for quite some time. I am fascinated by what scientists call “emergent behavior,” which is a fancy word to describe how huge structures like this develop stunning architectures, even though (presumably) the little insects doing the building have no idea of the overall bigger picture. Driving back to Bangalore from Tamil Nadu I encountered the largest anthill I’ve seen in my life. It was definitely an anthill – as could be seen from the huge number of large black ants swarming all over it. And in comparison to termite mounds I’ve seen, it was largely without any external features.